"Here's How To Quickly & Easily Solve Problems, Avoid Costly DCC Mistakes ... And Master DCC Techniques Like An Expert..."
With DCC you can have truly realistic operation without complex wiring. Your loco’s can run more smoothly, start easier, and operate at more prototypical top speeds with more pulling power. Truth is; your can easily program your loco’s to perform better than they ever did under the old DC system. Tiny decoders can give you complete control over the loco speed, direction, lights and sounds. With just the press of a button you can operate your locomotives, the points and all your accessories with amazing effect! DCC works with almost ANY scale or gauge: HO, OO, N, Z, S, TT, O, G... and, despite what you might have heard about converting your layout to DCC operation - you won’t have to lose anything, or change everything. Your DCC model railroad can be as simple or as complex as you want it to be. You don’t even need to convert your whole layout at once. Just choose which loco’s you want to fit with a decoder, and they’ll still run using DC control. When you’re ready to GO DIGITAL, you simply disconnect the old DC unit, and (using the same wires), reconnect your new DCC controller. It’s really easy! However, that said; there are things you need to know to avoid costly mistakes and have your DCC model train layout up and running “trouble-free” with minimum effort. That's where this "DCC Model Trains Handbook" can really come in handy. This ebook shows you step-by-step how DCC works, and how to have your DCC model train layout performing to perfection in no time at all. It'll guide you through the process in an easy way, so you can avoid the problems other experience. You'll be ready to operate your trains smoothly at amazingly realistic speeds, with all the lights, sounds and actions you could imagine. You can have it at your fingertips within 5 minutes ... so you’ve got no waiting… and no shipping to pay. You can view this ebook on your computer, burn it on a CD, or simply print out the pages you need. It’s really easy! DCC doesn't need to be expensive, but mistakes can be costly, not to mention the waste of time and frustration they cause. That's why it's best to avoid them occuring in the first place. You CAN take the right approach to old loco conversions, decoder installation, lighting CV's and other projects that would challenge the unenlightened. The DCC Model Trains Handbook will guide you step-by-step to have your DCC model railroad running to perfection in no time at all. Keep the handbook (e-book) by your layout, so it's close-by if you ever have any problems you want to solve about: decoders and packets, power districts, auto-reverse, consisting, programming, function key mapping and more. Packed with useful tips and ideas. This DCC Handbook even includes 22 questions and answers supplied by others in the hobby, as they explain their secret tips and how they overcame the kinds of problems you'll experience too. "A must have!" You'll also get to keep a companion ebook - "Model Railroad DCC Help". This ebook covers ALL the DCC basics, and answers ALL the questions you're likely to ask about DCC model trains and railroading. These are just some of the questions you'll get answered in the supporting "DCC HELP" ebook. DCC Wiring - KEEP IT SIMPLE covers everything you need to know about wiring from the ground up. It includes easy to follow wiring diagrams,wiring for reverse loops, how to program track, turnout control, using free software to control your layout and where to get it, controlling trains with computer technology and more. You'll also get the 7 Rules to help you avoid the BIGGEST cause of electrical problems. After reading this e-book you'll realize DCC wiring isn’t hard. In most ways it’s much the same as DC wiring. If you have reversing loops or wyes on your layout, you’ll need to pay some extra attention to be sure that the electrified frog issue is addressed... but don't worry, that's all explained step-by-step. It's only a matter of time before something stops working, and you’ll face the decision.Do I fix it? Do I replace it? What the F#&!!X*?! ;is WRONG with it? Model Railroad Trouble Shooting will help make your DCC layout a pleasure to construct and operate without ripping your hair out just trying to locate, or fix annoying or constant problems. This e-book is easy to read and will prove a valuable reference when something does actually go wrong. Secure your copy now! You may be concerned that these excellent DCC resources will cost you the earth... However, you won't need to worry about that. I've always had a policy of supplying value for money and that's exactly what I'm offering you here. I've had others say I should be charging $150, $200 or more for the valuable information in these ebooks. Truth is; I'm not charging $200, or even $150 for the useful tips and ideas you'll get here... even though they are likely to save you thousands over the lifetime of your model railroad. These 4 e-books are available separately for $67, or you can grab the special discount offer below. In fact; if you're decisive and act now, you could grab ALL 4 - the "DCC Handbook", "DCC Help", "DCC Wiring", and "Model Railroad Trouble Shooting" for a ridiculously low price of $67 just $37. Terms & Conditions apply. Full details below. And, you qualify for my full no-questions asked 60 day money-back guarantee. What could be fairer than that? PLUS, with the offer below you'll get even more ... To give you even better value, I'm including 6 valuable bonuses at no extra charge (total value $263.90), but you'll need to grab this NOW! In this e-book you’ll learn the details for building a layout, including choosing the best track plan for your space, building low-relief and below track-level scenery, and really low-cost industries to make. There's even 2 tutorials walking you step - by - step through the construction of a small railroad. Now... I'm the first to concede, this informative ebook won't detail totally everything. Truthfully; it would take literally thousands of pages of detail every aspect of this fascinating topic, but this ebook condenses the most useful ideas into 109 pages of useful help. This e-book covers various aspects of this wonderful hobby of model railroading. Obviously to cover everything would fill a whole library, so instead we’ll look at some topics within the hobby that people have a particular interest in and want answers to. I get dozens of letters and emails every week so I have compiled this e-book with many of the topics and questions in mind.... a wide range of tips from soldering and LED lighting, through to solving derailments and coping with S curves... and much, much more! This "Confessions of a Mobile Layout Builder" manual gives the ins and outs of constructing a portable train layout. It looks at track design options, construction methods, operation and expansion possibilities... with plenty more ideas to make the process easy. A must read! This 101 Handy Tips manual is a useful reference guide filled with tips and answers to common problems that confound most railroaders at some time or another. There are tips on: turnouts, couplers, shelf layouts, ballasting, power supply, track access, track cleaning, making scenery, flywheel problems, decoders, and plenty more! You'll also get 4 interesting and informative video clips which include lots of ideas for anyone in the hobby. You can download and save them to your computer for future reference. PLUS... An audio by veteran model railroader Tom Hobson who has personally installed 46 decoders in his locomotives. Tom shares some tips from his experience. The Online Model Train Club is a month-to-month membership. You may have a look around the club and if you decide to cancel within the first 30-days you will not be charged again. The first months membership is free and you can stay on as a member for as long as you like (you will be billed just $27 mth) and get to keep the 6 bonuses (even if you do cancel). The choice is yours! You'll gain access to more and more helpful resources each month. You may cancel in any month and you will not be charged again. This bonus allows you to access for a whole month, all the Level #1 resources of the online model train club including a helpful DCC video, getting started videos and tips, lots of planning, design and scenery ideas and much more. Why am I giving you free access for an entire month? Simple - I know you'll be impressed and not want to miss out on all the resources, tips and clever ideas inside the club. It is like a GIANT resource library for you to tap into when you need help. Or for just $67 $37 today you can get instant access to the DCC Model Trains ebook, PLUS the DCC Help ebook, PLUS DCC Wiring ebook, PLUS Model Railroad Trouble Shooting ebook, PLUS the other 6 free bonus gifts! Your initial charge will be $37. You will then be charged $27/month until you cancel after your initial charge has been made. So why am I giving you this entire package (valued at $263.90) for only $67 $37? Simple ... This package is delivered by download immediately your payment is processed. So I’m saving on shipping costs and can pass those savings directly to you. You'll get PDF files which are readable on any computer, tablet, or Mac. You can save the files to your hard drive, for easy access anytime, anywhere, day or night. They work on any computer! The downloads are quick even on the slowest of dialup internet connections. Other internet connections are considerably faster. You can freely printout whatever parts you want. I did investigate printing physical copies, but the price would have been more than 3 times the cost of this offer owing to printing & shipping costs. I’m sure you’ll agree, it’s best to keep it affordable. The videos easy-to-download mp4 format. Think about it... $67 $37 is a meager amount for such valuable step-by-step, easy-to-follow information. And, you could be underway within 5 minutes. Even just one single idea from this package might save you hundreds of dollars, so investing $67 $37 makes good sense. 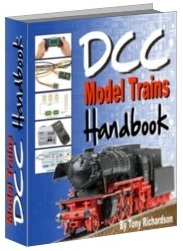 For just $67 $37 today you can get instant access to the DCC Model Trains ebook, the DCC Help ebook, DCC Wiring ebook, Model Railroad Troubleshooting ebook, PLUS the other 6 free bonus gifts! Your initial charge will be $37. You will then be charged $27/month until you cancel anytime after your initial charge has been made. As soon as your payment is approved, you'll be taken to your download page where you can access the DCC Handbook, DCC Help e-book, and all the bonuses within a few minutes. So, within about 5 minutes you’ll have the precise information you need to get started with a "trouble-free" DCC layout that will impress both yourself and your family and friends. Don't delay; the sooner you access these resources, the sooner you'll have your dream model train layout up and running! Take action NOW... not tomorrow! P.S. At last you can have your DREAM layout that will impress both yourself, your family and friends. It’s a “no-brainer” investing the $67 $37 to save yourself time, money, and frustration when planning and building your ultimate layout. You’ll avoid all the common mistakes, and have answers to those difficult questions at your fingertips. PLUS as always, you’ll get my personal 100% money back guarantee… It doesn’t get any fairer than that !! These e-books are NOT available in stores. You can only ge them through this web site.